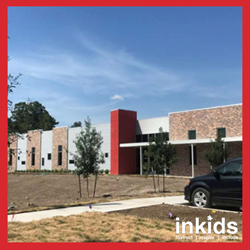 “Including Kids” is excited to announce the opening of their new 2.5 acre, state-of-the-art campus which will allow them to meet the growing needs of the community and serve hundreds of children and young adults with Autism Spectrum Disorder (ASD). By utilizing the principles of Applied Behavior Analysis, an intensive one to one instruction method, Including Kids prides itself on serving children and young adults of all functioning levels with the goal of inclusion for all. The 18,000 square foot facility includes a Community Skills Room with specific furnishings to help their clients prepare for dental visits, doctor appointments, and haircuts; a mock apartment to teach independent living skills; and a Community Outreach Suite with a resource room for community trainings. Outdoor features will include a playground, soccer field, basketball court, walking trail, and a Food Forest that students will nurture to grow fruits and vegetables. Including Kids, Inc. provides evidence-based, behavior analytic interventions for persons with autism and related disabilities to maximize individual potential and to facilitate their meaningful inclusion in the community. They were the first Texas-based organization to be named one of the top behavioral service providers in the country by receiving The Behavioral Health Center of Excellence Distinction. For more information, visit http://includingkids.org/.